Click to get the free eBook! There’s no substitute for getting face time with customers or potential customers, which means, when companies invest in hosting or attending a major event, making the most of it is an absolute must. Interactive Intelligence knew this to be true. A leading provider of call center technologies and software solutions, the company hosts a global conference every year which brings important customers, partners, prospects and stakeholders together to learn about the company’s vision and participate in thought leadership sessions. They ran a campaign using LevelEleven with the goal of aligning sales and marketing so that together, the teams could drive greater customer attendance at the conference. “In addition to the increase in attendance, the sales reps involved gained traction right away and were more knowledgeable about the conference and more connected than ever before. Also, since the executives had real-time daily visibility into the results, they were able to publicly recognize the efforts and success of the team, which helped boost morale and motivation even more. 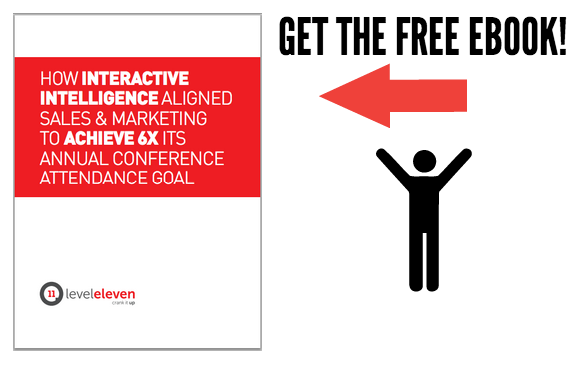 Learn how Interactive Intelligence beat their conference registration goal 6X over by motivating their team with LevelEleven.